Get ready, because at around one month in, you may get that dreaded call that your child is sick. It’s hard because suddenly, you feel even farther from your child than you actually are. It doesn’t matter how well you packed their first aid kit, or how many times you went over where to go to the health services, your child will probably need some extra love to get them on the healing path. When it is beyond a cold, and they find themselves really sick, try to keep in touch with your child’s roommates, as they will be able to give you updates on your child’s condition. Sometimes a care package can provide much-needed help as well. Things ship fast these days, and simple things like cough drops, tissues, teas, cozy socks, and maybe something homemade can lift spirits immensely. For those of you that think a little matzoh ball soup can cure anything, USF Hillel will deliver soup to your child’s dorm room or apartment. You don’t have to be Jewish to order from them, and it’s a great comfort that is offered. There are tons of sites that can put together a sick care package quickly so check out our blog on delivery companies. There are some pre-made gifts that can bring a smile to your sick child on Etsy. “Get Well” baskets and packages may include lip balms, candles, teas, and more. A soft, comfy pair of pajamas or a sweatshirt can be a great gift too. Check out Old Navy, Macy’s and Gap for quick shipping. When your child is sick away from home, it can be just as hard on you as it is on them. Sending a care package can make you both feel better. 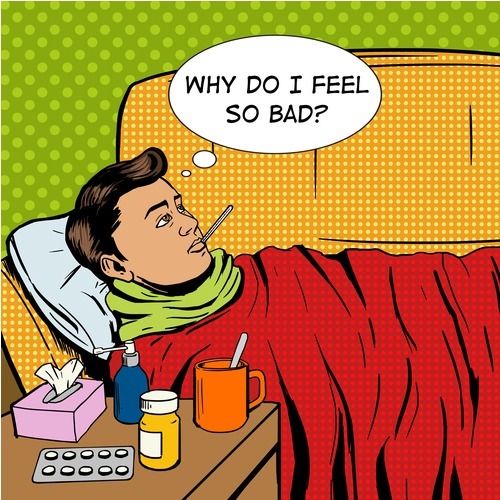 Take a look at our Sick at School blog in case they need to be seen by a doctor or will be missing class and need to notify their professor. Hope they get well quickly!